I had promised myself not to write about the relationship between property, banking and media again, but instead focus on far more worthy and uncontroversial issues such as the concept of ‘peace talks’ between Israel and Palestine. However, I was trapped in a car the other day (an incident that was not even reported, let alone syndicated around the world) and had the misfortune of being subjected to ‘news radio’, a recent phenomenon where the issues of the day are debated relentlessly between ad breaks. Matt Cooper: It’s fair to say you’re not entirely sympathetic to the idea of debt equity swaps or other types of arrangments that might help people reduce their debt burden? Charlie Weston: No you’re right Matt, I wouldn’t favour a massive big bailout for home owners, although I would have some certain sympathies for those genuine hardship cases. The problem are those people who used their house as an ATM, remortgaged their house or refinanced their house to buy a buy to let property. The most irritating part of the boom was going down the pub and listening to some old bore telling you about how they re-mortgaged their house to buy a buy-to-let property, and how they now have two properties. And how you’re a fool and how its easy money. The problem is that the money used to buy the buy to let property was secured on the home residence. You should never be allowed to use your domestic home as some sort of leverage vehicle where you take out loans on the back of it. The regulator allowed that to happen and I can see why some people are furious, that people that went out and abused their home by using it as a vehicle to invest in other things, used it to finance short term debts, who went off on holidays twice a year, who went shopping in New York who bought the trophy house, who bought the 4×4, those people now are going to have to be bailed out. That’s why the people who were careful are enraged that these irresponsible people should be bailed out. Of course there are responsible people, genuine hardship cases, but there are a number of people who are in arrears at the moment who behaved recklessly and funnily enough some of them are still acting recklessly. Weston purposely skews the debate, the subject of which was whether those encountering huge stresses due to mortgage commitments in a time of rising unemployment should in some way be supported by the state, but even if we were to accept his highly convenient narrative, is it consistent with Weston’s previous convictions and those of his employer? Rightly or wrongly, I felt the question deserved yet another painful dive into the miserable depths of the Irish Independent’s archives. A world that is punctuated by tedious bios of Ireland’s modest, unassuming, but glamorous elite (Surprisingly I came across only one article from my previous visits, a cracker by Ken MacDonald ‘Property market’s no house of cards‘). The message relayed on the business and national news pages on the other hand was less assured, tending to temper market hype with mild scepticism and appeals for caution in the closing paragraphs. In December 2006 Weston’s colleague Kevin Murphy advised readers on “How to make a killing in foreign property.” The countries topping Murphy’s list of foreign investment markets were the Czech Republic, Slovenia, the USA, Poland, Romania and Estonia. Murphy did however voice a word of warning for potential buyers: watch out for the red tape! These days Weston is clear about the state of the market, but he still quotes the likes of EBS executive Dara Deering, who reassures readers “the improvement in affordability was set to continue.” The same EBS who in August last year could be found publicly begging to be bailed out and only yesterday became effectively nationalised. Suffice to say, Weston and the Irish Independent were “the most irritating part of the boom,” not the chumps that bought the snake oil. More interestingly, this meander through the Irish Independent’s archives also led me to a puff piece about property developer Garrett Kelleher, an unassuming tycoon whose latest plan was to build the tallest office tower in North America. 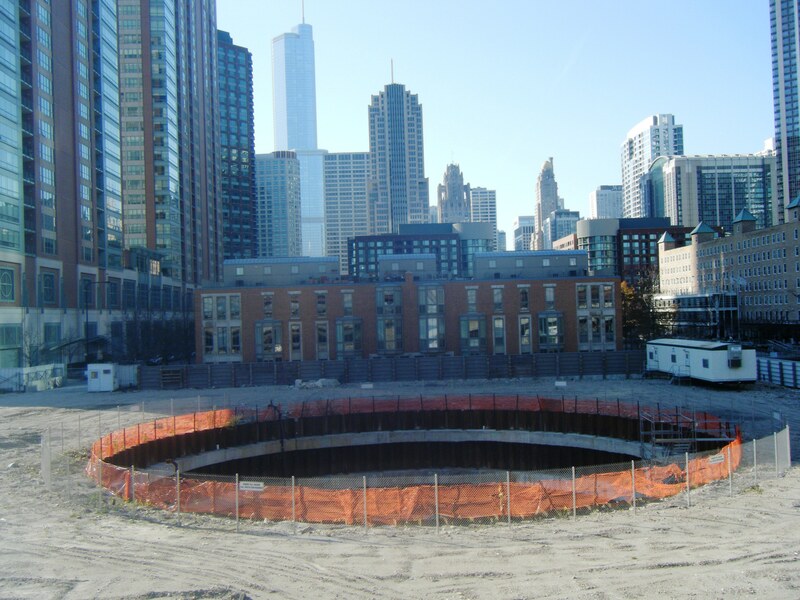 “Some of the top ideas for the spire hole were a temporary cabbage field, a bungee jump into the scar, a solar heated halo of water from the hole, a water park, and a fundraising wishing well. A panel of jurors picked the winner and the grand prize of $3500 went to Alex Lehnerer, a professor and his team from the University of Illinois at Chicago for their idea called the ‘Second Sun’. His winning idea is simple. It’s a giant yellow ball made to compliment the Chicago skyline and instead of hiding the hole, it’s highlighting it. “We love the hole. 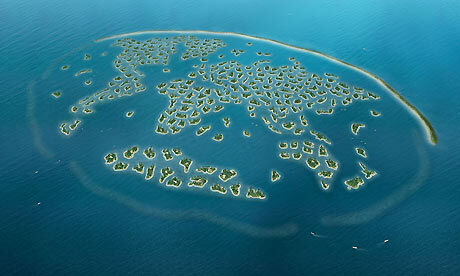 We would like to have the hole there forever,” Lehnerer said. 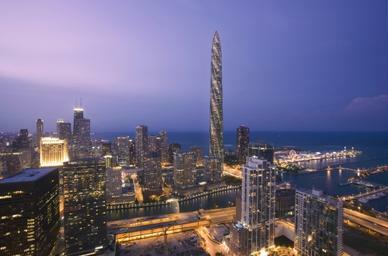 Perhaps we need to take the lead from Chicagoans and learn to love the hole. 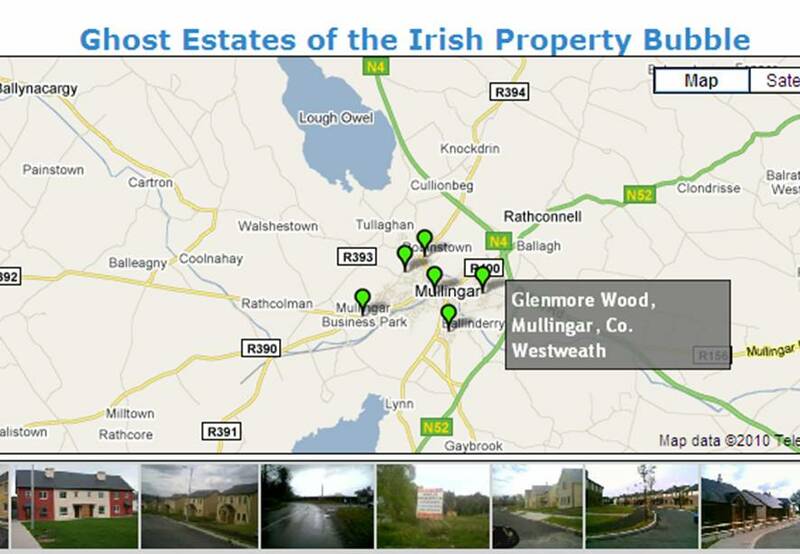 The link brings Irish Times readers straight to the MyHome.ie database, within which the budding property tycoon can buy any number of houses located in so called “ghost estates”. The ads are just one small part of it. 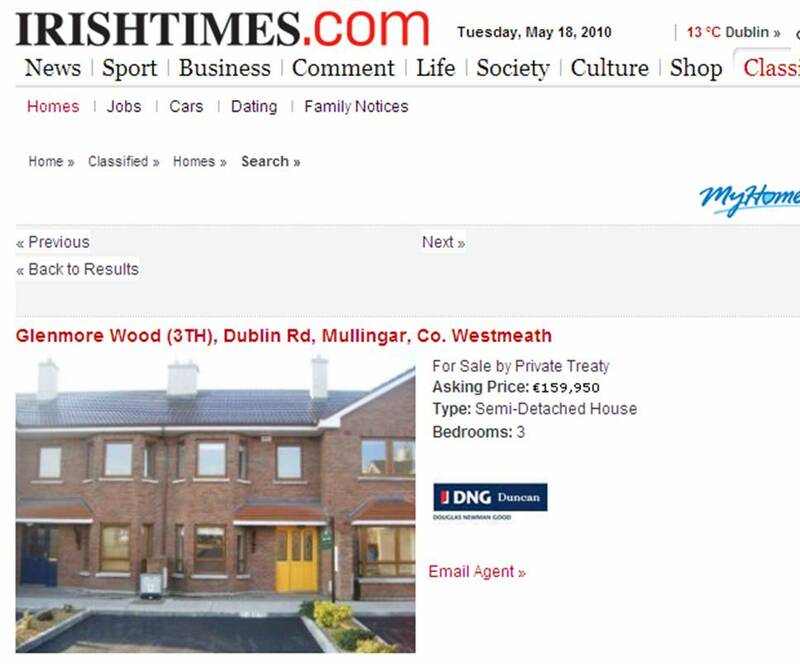 I’m not saying the purchase of MyHome.ie in some way impinged on the journalistic integrity of the Irish Times, it was just a natural step for an organisation that had become increasingly reliant on property revenue. The Times, just like other papers, tended to promote a certain lifestyle that suggested investing in property was a sure thing. And this view wasn’t limited to the property supplement, which in effect became an advertising supplement as opposed a news supplement. The relative absence of alternative perspectives in the paper itself up until 2007 is evidence enough of this. I’ve no interest in speculating on John’s personal motives for moving house in 2007, but to say that newspapers and the advertising they choose to carry don’t have a real input into the way society and the economy operates seems wildly out of step with the way the Editor sees the papers role. The contradiction I was noting with my initial post was not that ads / reporting influence decision making, that’s a given, but that while the FT illustrates the news with ghost estates, the Times frames the news with ghost estates. Readng Terry Prone’s latest column, reminds me of an elderly relative who was staying with our family back in the early 1970s. She had never come to terms with telephone technology and was sure nothing good could come of it. Letter writing and telegrams made sense to her but a voice coming out of a bakelite handset made none whatsoever. So it is with Terry Prone and communication via the internet and social media. Apparently unfazed by the fact that the nation can scarcely open a newspaper or switch on the telly or the radio without being assailed by Prone herself, she berates the citizens who can now talk back to the media via email, text messages and twitter. She accuses us of being ‘permanently angry’, for instance. Too damn right we are – and we will continue to be powered by anger unless or until we finally have something approaching an equitable society – something that Fianna Fail have been the better part of a century denying us. It’s perhaps understandable that someone who has been declaiming on the nation’s affairs on behalf of her paymasters in Fianna Fail from a patrician perspective for so long might have difficulty in suddenly having to share the media space with the hoi polloi – but sympathy for her should stop there. What a breathtaking sort of arrogance it is for Terry Prone of all people to accuse radio presenters of focusing too much on our ongoing, serious difficulties. Perhaps her resentment results from an uncomfortable awareness of the keen part that she played in helping to bring this situation about. And it’s another universe of insult altogether to suggest that ordinary people who choose to participate in the public discourse are some sort of dehumanised mob that ought to be ignored, the better to preserve the airwaves exclusively for voices like her own. Most likely the real reason listening figures are down is precisely because more and more people are discovering the advantages of the participatory nature of alternative news media. In Terry Prone’s protected world, apparently, it is far better that we go on dutifully ingesting reproaches like hers from without the far less democratic traditional media. And no, Terry, necessarily holding to account Fianna Fail politicians who are in deep, almost pathological denial about the crisis they recklessly created does not compare to unreasonably blaming them for a failure to predict the activities of a volcano. But nice try, anyway. Nice spin. Miriam Cotton, May 18th 2010.